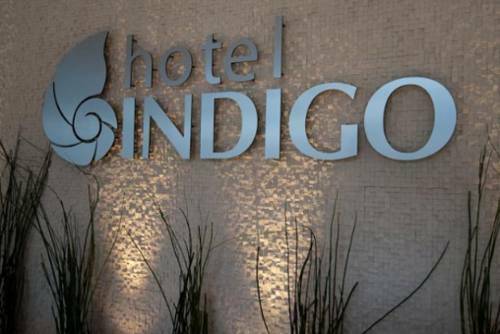 Sheltered by a canopy of magnificent oaks, the Hotel Indigo New Orleans Garden District hotel is a symbol of inspired neighborhood fusion on St. Charles Avenue. Our design and decor reflect the lush gardens, distinctive architecture and diverse culture of the Garden District. Were situated directly on the scenic St. Charles Streetcar line and the Mardi Gras parade route, just a short ride or walk from the famed French Quarter and other destinations. Our Babins Bar & Bistro serves local fare and creative cocktails indoors or on our outdoor patio, and our meeting space hosts events for groups of up to 60. Babin s Bar & Bistro: Upscale bistro overlooking St. Charles Avenue Streetcar line featuring local favorites. Enjoy breakfast, dinner and coffee service in our dining room or enjoy service in our al fresco dining area facing the famed St. Charles Avenue Streetcar Line. Babin's Bar & Bistro: Upscale lounge adjacent to dining with outdoor seating available. Enjoy a cooling concoction prepared by one of our knowledgable mixologists in a cool calm environment. Livaudais: 828 sq ft street level meeting room with floor to ceiling windows and patio access. Ideal for business or social events. Lafon Boardroom: The Lafon Boardroom is a conference style space that fits up to 15 people seated comfortably. As an extra bonus, the room has a private bathroom. Magzine Street RetailersUnique local stores & boutiques. Three blocks from St. Charles Ave.
Audubon Golf CourseLocated in the heart of Audbon Park this par 3 golf course includes clubhouse with brunch and dining service, caddy service, club and cart rental.